An equal mixture of dark comedy and tremendous sorrow, Three Billboards Outside Ebbing, Missouri is about as close to violently profane yet surprisingly tender that one could find in film. 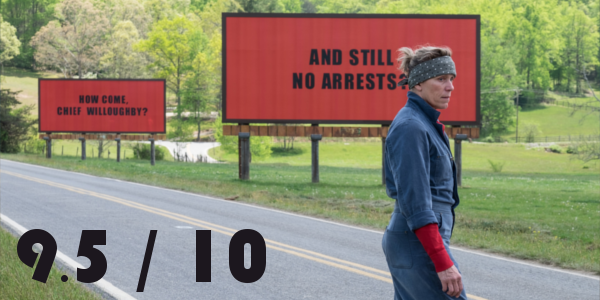 Anchored by a dynamite performance from its lead and a stellar screenplay from its writer-director, Three Billboards finds a way to keep everything unbalanced while strangely focused at the same time. After months have passed without a culprit in her daughter's murder case, Mildred Hayes (Frances McDormand) makes a bold move, painting three signs leading into her town with a controversial message directed at William Willoughby (Woody Harrelson), the town's revered chief of police. When his second-in-command, Officer Dixon (Sam Rockwell) -- an immature mother's boy with a penchant for violence -- gets involved, the battle is only exacerbated. Three Billboards Outside Ebbing, Missouri finds an interesting way to feel intentionally messy yet always intelligent. The story it presents and the world it creates feel real, lived in, and like there is a history to these people and this town. And in this way, this way the screenplay really shines. Snappy dialogue and riveting plot points make for a mesmerizing affair that draws humor and sadness from these characters darkest moments. Speaking of those characters, writer-director Martin McDonagh finds a way to craft a fascinating, if not a little weird, set of people. These individuals aren’t terribly likeable as characters but they’re always interesting and fully developed. But perhaps even more noteworthy are the performances. Frances McDormand is unbelievably amazing in this role, determined and driven by this desire to find justice. There is a reason she is the frontrunner for the Academy Award, and don’t be surprised if she runs away with it. Sam Rockwell is also a standout with undoubtedly the biggest character journey. Despite being the most horrible person present, his seemingly oblivious persona makes for some great moments of comedy and eventually some redemption. The rest of the cast including Woody Harrelson and Peter Dinklage fill out nicely for one of the best ensemble efforts of the year. The combination of dramatic moments and black comedy in Three Billboards Outside Ebbing, Missouri is ridiculously seamless from scene to scene. That’s not to say the film doesn’t have smaller, more touching moments either, but the film certainly shines when it toes the line of brutal comedy. The film doesn’t ever betray this tone either, never falling under pressures of possibly going right where the audience expects, frequently breaking expectations. Overall, Three Billboards Outside Ebbing, Missouri is an exceptionally well-made film led by a fantastic performance from McDormand and a stupendous screenplay from McDonagh. The rest of the cast fills in nicely as well with Rockwell grabbing a majority of the spotlight left over from McDormand. There is absolutely no reason to question why this is the frontrunner for a couple of different awards, as Three Billboards is one of the best films of 2017. 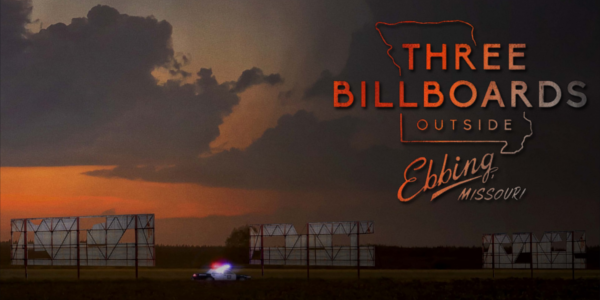 So what did you think of Three Billboards Outside Ebbing, Missouri? Have you seen it? Are you interested in seeing it? Share, subscribe, comment below, and as always return to I Am Sam for weekly reviews and insight.